Alas! Friday! Not just any other friday, the friday before Resurrection Sunday. Many years ago, a very important event took place today and an equally important event took place on Sunday. If you need a place to celebrate, come join us! See more info here. 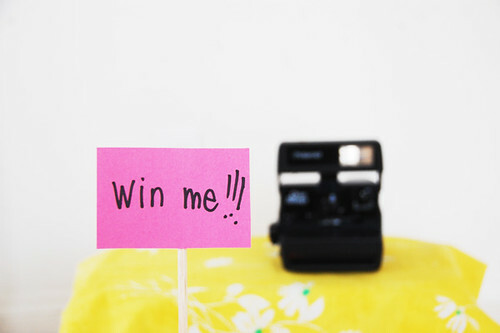 And so to celebrate, I am giving away a working polaroid camera to one of you! 1. Tell me about your Easter plans. 2. Become a follower through google or bloglovin' and tell me so with another comment. 3. Blog, tweet, or facebook about this giveaway and leave separate links here. 4. I feel blessed to be nominated alongside some of my friends (and other wonderful blogs) for Circle of Moms: Kids' Style and you can give me a vote by clicking the widget on the top of my right sidebar and give me a thumbs up! The contest runs until May 9th (you can even vote everyday if you want), but really being on that list is fabulous enough as there are so many blogs I admire on there. If you vote, just let me know in another comment. So in total, you can leave me 6 separate comments, which means 6 chances, to win the polaroid camera! I think that is pretty great! If you are overseas, you are welcomed to join in too! The giveaway will end Sunday, April 24th midnight PST and will be announced sometime Monday morning. Polaroid film can also be purchased here, in case you are wondering. Good luck folks and have a happy Easter weekend! If you decide to visit our church, let me know and please don't be shy to say hello! p.s. there will be another giveaway tomorrow, so check back and don't forget about this other giveaway going on now too! This Easter we will be going to church and I will be counting the days until my 3rd little one makes his appearance. He's due in 6 days!! Gave you a thumbs up! rest and relaxation for me this easter! For easter we will do a special lion celebration. Since Jesus is the Lion of Judad and my son is really into Lion. We will celebrate the resurection of Jesus the Lion of God !! This Easter I am traveling home to celebrate with my family! First time in 2 years because I've been at school. Lots of family love and decorating eggs! I'm on of your follower ! I also gave you a thumbs up! I voted for you !!! This Easter weekend, I'll be watching my dad 'point' the patio--it's just refilling all the cracks with cement--and making Easter nests from crushed cereal, melted chocolate and lashings of syrup. I'm a follower. Your 2378th to be exact. Until now, I just had Cakies bookmarked. And, of course, gave Cakies a thumbs up! Congrats on being nominated and good luck! We'll be having a small egg hunt in the morning, learn more about the real reason for Easter, eat some good food, go to church, and then more time with family. I'm looking forward to it and my sewing is almost complete! And I give Cakies a big thumbs up! Church and dinner with friends. I'm looking forward to it. I'll be cooking yummy eats and spending time with my family and probably puttering with my plants on the deck. I voted for you on circle of moms. Good luck! I've been voting for you every day! and just put my thumbs up for today! My husband and I are trying a new church and then just having a quiet Easter dinner together. I voted for you, yay. My husband and 2-year-old daughter will be heading to church this Sunday, but I will be home with my 9-day-old son. I'm sad to miss church on Easter, but I'll still be rejoicing at home! easter will be a lovely bike ride to Mackworth island in Maine and a quiet dinner with my husband. Yay! Oh please oh please :) Our plans are to drive to New Jersey (from Boston) after work tonight to spend a long weekend with my grandparents. They're in the middle of selling their house and moving into a smaller place so it's the last time we'll all be together in the home I've known them to live in my entire life. I'm going to take lots of photos of my little boy (18 months) running around their backyard! Hello! this easter i will be going to rather a lot of church services and dying eggs with my cousins ! I am a follower ! I just voted for you for Circle of Moms. One happily given vote for you! This Easter, I actually am working night shift on Saturday (ugh, the life of a nurse). But will be driving down to make a later church service with my family after work! Then I'll be hopefully be catching up on some sleep :) It will be a wonderful resurrection, Lord's day! This is our first Easter at the church we are planting in Boulder, CO. I'm so excited to celebrate! I'm planning on spending Easter with my fiance, his sister and a few friends. We're going to have a fancy dinner and I'm going to make strawberry shortcake. Yum! This Easter we have six services, and my fam will be at five.. then after that we will probably collapse into exhaustion.. actually we will eat dinner at a friends house AND THEN collapse..
My parents are coming down to visit me this weekend and we're going out to brunch on Easter sunday! Also, I already follow you on google! We'll wake up to Easter baskets. Then we'll go to church. I have to teach the 2 year old class for all 3 services. Ai-yai-yai. Yay, how fun! Easter plans include making pierogies on Saturday and going to see "African Cats" the Disney movie. And on Sunday, brunch brunch brunch, we're making a feast for the two of us (my fiance and I), which will include coconut french, hot cross buns, toast & smoothies! we're hosting an ethnic food potluck at my house with a mini-easter egg hunt for the kiddos! i follow you on my google reader! i voted for you! hope you win! oooh i love polaroids :) This easter my husband will be busy studying for a final on moonday :( and so i will take this time to work in the garden, bake some bread, go for walks with my little niece and take some time reading over the story of jesus and his goodness... have a wonderful week-end. your kids are always so well dressed - how could i not vote for you?! This Easter Sunday the husband, baby boy and I will be attending Easter Sunday service at our church...and after the service there'll be a potluck, and we will just enjoy each other's company and most of all rejoice that Jesus has risen! We just moved to a new town so we're going to go to Easter mass at a church that is brand new for us. We're pretty excited. After that we'll probably have a nice lunch and chat with our distant relatives over the phone :) Happy Easter! I gave you thumbs up!!! AND I voted for you (for the second time) on circle of moms- hooray! Planned a Bake sale and Easter egg Hunt for Sunday after our service with all the kids with my church. Following you on bloglovin too! I follow your blog via GFC as Lesapea. I voted for your blog as well, let us know if you win. okey dokey so we are going to church in the morning and having lunch/hang out day at my parents and we are bringing a new friend from church who has no family around here! I already built hubs his easter basket! Yay! Happy Good Friday! Thank you Lord for the ultimate gift of salvation! I am a follower!! YAY! voted on Circle of Moms! I've been voting everyday! We are going to a solemn Good Friday service tonight and then a big celebration on Sunday with breakfast at church and lots of flowers. We're also quite new here and have been invited to a special dinner with a friends family which is very special and thoughtful of them. I also voted for you in the Circle of Moms competition. Thumbs up Rubyellen! I am super excited about this Easter! My home church of 14 years is launching a new campus on the north end of our town this Sunday! And even cooler (i think) is that the building isn't quite ready yet, so the first service (which just happens to be the Easter service) will be held in a tent!! I am thrilled to see how God will work through the expansion of my church through this new ministry starting with a tent service! After church all my grandparents will be coming over to join my family for brunch. I am looking forward to an exciting day celebrating the life we have through Jesus! Easter plans start tonight for Good Friday. We are going to church then back home for dinner. Saturday we are dying eggs and me and then I am getting all I need to have their baskets ready for Sunday morning including baking, sewing and buying goodies. Sunday, Resurrection Day, as soon as they wake up they will have their baskets waiting for them, then breakfast and off to church first service. I love going to first service because it's like the first Resurrection Day going to the tomb first thing in the morning. Hope you have a wonderful Resurrection Day!!! Visiting both families, church, brunch with friends...it'll be a great weekend! :) Happy Easter! And I just voted for you :) I hope someday when I have little ones I can dress them as adorably as you dress yours! i'm following you via google! Thanks so much for doing this sweet giveaway! Joyful Easter Blessings to you and your family! my daughter is only 8mos this easter so we won't be doing an egg hunt... we're going to dress her up as a bunny, take a few pics, and then go out to eat! yum! I am a follower. I also blogged about the giveaway-- leaving a general note about my love for Cakies! Enjoy! I also voted for you today in the Circle of Moms Competition! Good luck! We're spending Easter with my husband (who has been working out of town for the past four months. We've only been able to see him four days each month since then -- Needless to say, we miss him like crazy). We'll be going to church this evening and again on Sunday. And, I plan to make a nice Easter dinner and enjoy every second we get with him while he's here. I am going to church with my family saturday night through sunday morning as in my church they greet THE SUNDAY in church! I am excited! Wish you and your family a great easter as well! God bless! My easter celebration started this afternoon with a bbq to celebrate good friday! For Easter Sunday I will be attending church for our annual cantata! This Easter I am going to auctions with my dad, & I couldn't be more excited! church/family lunch/egg hunt with the niece and nephews! Church and dinner with favorite friends and a little Easter egg hunt for our littles! Happy Easter! Gave you a thumbs up!!! ooh! what a great giveaway. we might be going to church. it's been awhile. and then brunch at my parent's - our yearly tradition. Good Friday brunch with family, church on Sunday and lots of relaxing and quality time with my husband. This Easter weekend my sweet little family will be relaxing and eating some yummy food! i've been following for so long! but now i made it official! easter will be visiting my mother in law (who had surgery yesterday). If she's up to it, we will all go to church. And the kids will sing Jesus songs too I'm sure. my Easter plans include lovely time with my church family and my mom...and goood naps and food! i've been linking over to your site for a bit now, but now I'm a follower thru bloglovin! voted! - you got a thumbs up from me! This Easter our church is going to have an outdoor Easter Sunday service in a park. We also have potluck lunch and games, so it should be really fun and i'm really looking forward to it! gave you a thumbs up at the circle of moms! We are planning to do an egg hunt for the kids tommorrow so Sunday won't be so busy busy. We're going to church on Sunday and then my in-laws for dinner. Which I'm baking a cake for. Now I just gotta get some tights for my 4-yr-old who is growing WAY too fast! I have wanted a polaroid for so long! I am going to church on Sunday and then going to an easter egg hunt in an antique mall where some of the eggs have gift certificates! I am a follower on Reader! so fab! easter i'll be spending with family! also gave you a thumbs up! Family lovin' is on the calendar for us this year. Easter will be spent at my parents' place, and I'll probably sleep over on Saturday evening. We'll go to church in the morning then just relax together before having a delicious turkey dinner. This easter our family's making a tomb cake aka. instant chocolate cake mix and a hollow easter egg on top. Tomorrow after church, we're bringing out the spoons and wacking the egg.Oh, the egg represents the tomb and we're celebrating that the tomb is empty and Jesus is alive! i plan to go to church to worship Jesus for what He did for me! I am going to spend time with friends and family, laughing and sharing, painting and hunting for eggs! This will be the first year its just the two of us. Things have been crazy with school and work so we wont be able to get home this weekend. Looking forward to making my first Easter brunch. I reposted on my blog Happy, Be. I squealed when I saw this giveaway! Gave you a big thumbs up! This weekend I hope to finish making my wedding invites, make cookies that include mini eggs, church again on Sunday and buy myself some tulips! Dinner, brunch, dinner, and an easter egg hunt-- I'm so excited! 5. AND I "facebooked" about the giveaway too and all my plans on using some polaroid pics to collage an entire wall in my bedroom! For Easter, we'll be celebrating Jesus resurrection at church! Then yummy food with people we love! :) Hope you have a wonderful Easter! Ooo pick me, pick me! No big plans this easter, just spending time with my 4 kangaroos!! I love Manila during Holy Week, almost everyone else goes out of town. Which means we stay home and have a quite and peaceful holiday. :D Easter is usually just my dad, my sister and I, and anyone else who happens by. Some years we're at some cousin's or other, but looks like this year will be just us since my brother and his family are out of town. this sunday i'm teaching sunday school for small kiddos and celebrating the good news that Jesus is alive again with them! hope you have a fabulous easter!! My husband has to work, the kids and I will do a little Easter Egg Hunt while waiting for Daddy! my easter plans are going to church and then dinner with the extended family! i started following with google reader! i gave you a thumbs up! Tomorrow my in-laws are coming in town for easter and eating at my house for the first time!!! ahhh... kind of freaking out! For easter, I'll be spending time with family and going to church. Then coming home to plenty of yummy food. I've been following for a while through google! Easter plans have been modified due to a fierce flu bug that has made it way into our home. However, we will still bundle up (in my bed) and read about the Resurrection and celebrate on a smaller scale with soup and juice. I'm following you via my google reader~! My Easter plans are breakfast with my mom and family and then dinner with husband's family! He is risen! I am also already a follower via Google Reader! My Easter plans... hmm for the first time I won't spend time with my lovely family because I'm far away from home in College. Different city, different people, different everything. I would miss my mum and dad sooo much and I don't know how I will get throuht this. I'm from Poland and in my country its extremely important that family eats Easter Breakfast together to celebrate the Ressurection of Christ. But as I said, I will have to spend this Easter without my lovely ones, only with my best friend in our little flat. Hope you will have joyfull time with your adorable family. No everybody will know about this lovely giveaway ! Thumbs up! In fact I've been voting everyday for your blog and also for Miss James from Bleubird. You are icredible mums and I love to read your adorable notes about kiddos. Again God Bless You, your lovely daughters and husband. going to church with my husband's family and celebrating after with delicious home-smoked meat! I'm working on Easter! I'm not bothered by this though because I wouldn't have been doing anything. I think I'll call my Grammy though, she'd really like that. For Easter, my family is celebrating today because my dad will not be home tomorrow, and we are having some good friends and family over for delicious food.